My first big leap into the world of green was deciding to cloth diaper my oldest son. He was about a year old and I heard other mom's buzzing about the new styles of cloth diapers. They were throwing around words like pockets, stash, fitteds, longies. I was curious, but completely confused! It took me quite a while to decipher all of the abbreviations and slang terms and feel like I had a good base knowledge about cloth. So while on a trip to see my grandparents (sans Hubby) I started researching and purchased my first diaper set! It was called something different at the time, but it gave me the bug and I've been hooked ever since! I've cloth diapered all 4 of my kiddos, and its a passion, an obsession, and sure to empty your Paypal quick! So here is my gift to you. Cloth diapering 101. Everything you need to know if you're considering making the jump, or have already lept but feel like you're free falling. All-in-one's - Also known as AIO. This is as close to a disposable diaper as you can get. They are full ready to go and have either snaps or velcro (aplix) to close. You just put it on, and take it off when it's dirty. Easy peasy. Pockets - Similar to an AIO, but you select the type and amount of absorbency that you want. You choose the type of material that works best for you and can add more inserts to bulk up for nighttime, or slim it down and decrease the amount of inserts for a slimmer daytime fit what you baby will be changed more often. Fitteds & Covers - Fitted diapers are similar to an AIO in that you don't have to stuff them, they are all ready to go in the absorbency department, but you do have to use a waterproof cover with these. That can be either PUL (polyurethane laminate - used when talking about the fabric that has been backed with PUL to make it waterproof), fleece covers, or wool. We'll get into the specifics of covers in a bit. Flats, Contours, & Prefolds (PFs) - These are similar to the diapers that our mom's and our mom's mom's used. Flat and prefolds are rectangular cloths that you fasten with pins or a snappi (a modern answer to all the thumb sticking that diaper pins caused in years gone by). These obviously need covers as well, and your options are the same as with a fitted. Hybrid - No, not a Prius, a diaper. A Hybrid has a waterproof washable shell with either disposable or washable inserts. You lay the insert in the shell, when baby goes to the bathroom you flush, compost, or trash the disposable inserts, or put the washable ones in your pail. Then add a new clean insert to the shell and you're ready to go again, until the shell becomes soiled. Covering options - There are several options here. You have PUL covers that snap or velcro, fleece made into soakers (underwear shaped), shorties (shorts), or longies (pants), or wool made into the same. If I'm going to cloth diaper, what do I need? Diaper Pins/Snappi - If you're going to use flats, contours, prefolds, or some fitteds you will need a way to fasten them. I think everyone knows what a diaper pin is, but if you haven't delved very far into the world of cloth you're probably not familiar with snappis. It is a pinless diaper fastener that is made of non-toxic stretchy material. There are teeth on each of the 3 ends and these teeth grab hold of the diaper fabric and hold it in place. Diaper Sprayer - No matter what phase of diapering you are in, a diaper sprayer makes life so much easier! It looks like the same sprayer you use in your kitchen, and it acts much the same, but this one attaches to the plumbing for your toilet. Instead of the old method of sloshing, dunking, and swirling poopy diapers you simply spray them and be done! Cloth Wipes - You're saving money, lessening waste, and using materials that are better for your baby when you cloth diaper. So why not take that a step further and use cloth wipes right along side. It's really simple to make your own wipe solutions, you control the ingredients, and you NEVER have to send your husband to CVS at bedtime because you just used your last wipe and someone has a poopy diaper. Not that I've ever had to do that or anything. Not me. Nu uh. And as a little bonus, they are really cute! Look at THESE from Frog Loves Monkey on Etsy.Wouldn't it be fantastic if cloth wipes teamed up with burp cloths at baby showers? 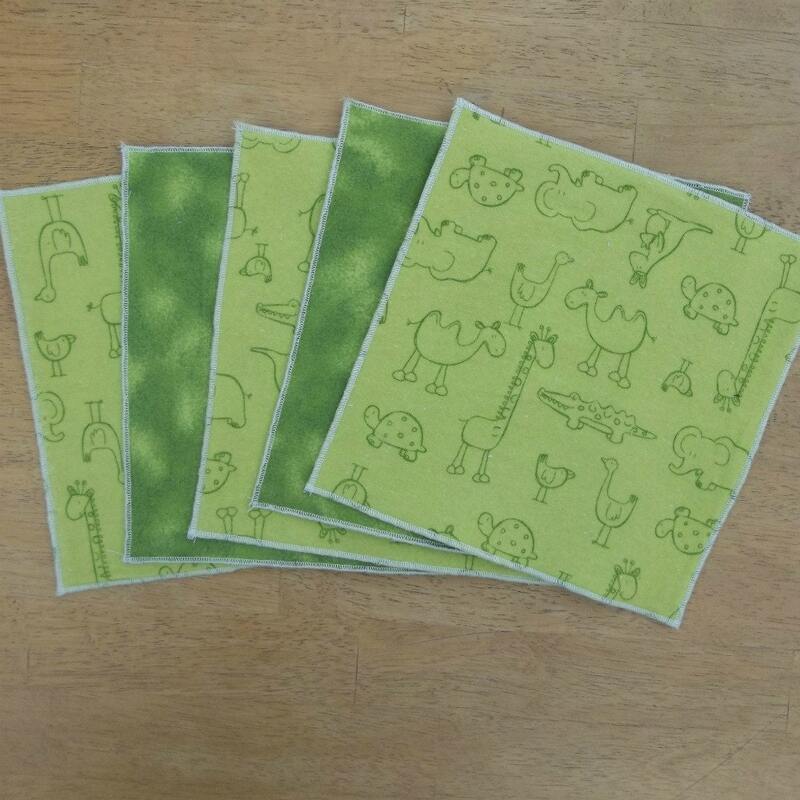 Look at these adorable GREEN wipes!! Chances are, you will. But that's ok, because there are solutions! Stripping - No, no, no. Not that kind. But man alive... look at those... ahem, back to diapers ladies. Periodically through your cloth diapering career you will need to strip your diapers. If they start to repel, get any sort of buildup on them, smell of ammonia - these are all signs they need a good stripping. Many a mom has given up cloth because of stripping woes, but with Dawn dish soap, oxygen cleaner, bleach, and vinegar thrown in my rinse cycle I haven't had a problem yet! Yeast - This is probably the worst problem to have with cloth diapers. Yeast infects your baby and it infects the diapers. Step 1 is to treat your little one both topically and dietary, as yeast originates from their body. Then you have to get the yeast out of the diapers or they will reinfect your baby. I use the same routine as for stripping, but with some tea tree oil thrown in the wash for good measure. Make sure to wash with HOT water! Cloth diaper speak can sound akin to pig latin, so here's a guide, courtesy of Diaper Swappers, to help you through. If you're searching for dipes and stumble on a word or anonym you don't know, come to this post, push ctrl + f, and type it in. If it's not in this post either comment and ask me, or EMAIL ME! I would love to help! EC: Elimination communication:[/b] it is where babies don't wear diapers and the parents watch for cues that they are about to pee or poop and take them to the restroom. Lots of mamas swear by it (and it is practiced exclusively in many third world countries). RLR: is a laundry additive that softens the water and helps remove/prevent build for people who have hard water. RME: Revolution Money Exchange A new company that is competition for Paypal. STM: ship to me, as used during co-ops and presales where you have to pay to have your item shipped to the person running the sale and then again to have it shipped to you. Wool Soaker: A wool soaker is basically a diaper cover made exclusively of wool. Great, now I want fluffy mail. Fantastic! You can go to any number of sites to buy new diapers or you can hit up Diaperswappers for some quality used diapers at a bargain price. If there is something you want to know about that wasn't covered here, ask away. Happy diapering! Oh no! What happened a week ago? Wow, great post!! We switched to cloth finally when my son (now 2.5 years) was 8 months old... part of the reason we didn't switch sooner was because it was just all SO confusing! This post would have helped me :) Going to share it! Thank you! I try to spread the word about how easy cloth is to do now, as much as possible! I love AIOs. Great info here. Thanks for sharing.